Does this recipe look familiar to you? I originally posted it almost 3 years ago as a sponsored post by Kraft, highlighting their line of Philadelphia Cooking Creams. This recipe has done super well, ranking as my second most popular recipe of all time. Sweet! However, this past year Kraft discontinued their cooking creams. The Italian Cooking Cream was one of the main ingredients in this recipe. I have heard from many, many of you who have been disappointed at not being able to find this blessed cooking cream anywhere and haven’t been able to make this recipe for some time. So sorry about that! You never know when a brand is going to up and flee the market, yes? Anyhow, I have been working on this recipe and have tweaked it so that you no longer need to purchase the cooking cream (you couldn’t even if you wanted to, dang it!). I have adjusted the recipe, using regular cream cheese and some basic pantry staples to season it. The result it wonderful and very similar to my original recipe. In fact, if you want to make it without making the crispy chicken to go with it…you could. It’s that good. 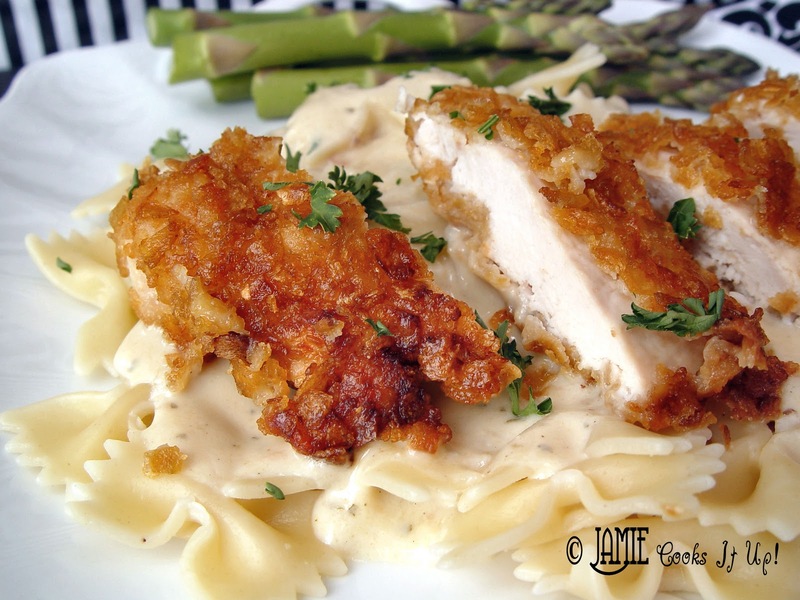 So good that not only did I include the ingredient list and instructions in this post but have made a whole separate post for just the sauce and pasta called Creamy Bowtie Noodles. Here is a photo of the new and improved sauce. I posted it today as well, you can look for it by scrolling down the home page, or just click here. The sauce and noodles come together in only 15 minutes! My family loved them, I loved them…I hope you will love them too. And so, ladies and gents. There you have it. Crispy Chicken with Italian Sauce and Bowties (new and improved! just keep scrolling down to read all about it) and just plain Creamy Italian Bowties if you want to sack the chicken and make things super easy. Now, scroll on to see the improvements up close and personal. 3. Place the flour, milk and crushed corn flakes each into their own separate pan. Loaf pans work well for this. If you don’t have three loaf pans, do not dismay. You could use pie tins, or round cake pans…what ever works for you. 13. Grab 1 package cream cheese and place it in a small bowl. Pop it into the microwave for 30 seconds. Add 1 tsp Italian seasoning, 1/4 tsp granulated garlic, 1/2 tsp oregano, 1/4 tsp seasoned salt, 1 tsp chicken bullion granules. Stir it all in to combine. 14. Into your skillet place 1 tablespoon of butter and allow it to melt. Add 2 (10 ounce) cans cream of chicken soup, 1 C chicken broth (I used 1 C warm water + 1 tsp chicken bullion) and 1/2 C milk and the seasoned cream cheese. Whisk it well over medium high heat until it starts to bubble up. Let it cook for about 2 minutes. Out 2 10 ounces of chicken broth? This isn’t really detailed enough Do you mix the cream cheese mix into the soups? this seems like a lot of creamy garlic sauce? I wonder if I can half this ??? It was alot of sauce. Next time I will use only 1 can of cream of chicken but leave everything else the same. LOVED THE ORIGINAL and was heartbroken when we couldnt find the cream. Made this tonight we had some extra sauce, and it freezes wonderfully! Also used some for leftovers with the noodles for lunch. Big hit, skipped the chicken bouillon, we didn’t have any and still came out great. Just as good as the cooking cream! We made this for dinner tonight and it was AMAZING. <3 Thank you!!!! AMAZING!! I made this tonight and my extremely picky children and husband gobbled it up! The chicken was fantastic just by itself, and the sauce was wonderful! I made extra chicken as well, I thought it would be great in wraps for our work week lunches. Thanks for the recipe it’s a keeper! This is DELICIOUS!I will add to my list of easy favories. The only thing I did different was oven fry the chicken at 400 turning once. Thank you. WOW!! This was soo delicious and I loved your directions! Thank you so much for sharing!!!!!!! What kind of cooking cream cheese is it? I did this recipe about a year ago and you had a different kind of cream cheese. I cannot even find that cream cheese anymore what kind was it? I made this recipe over a year ago and I do remember that you had a specific cooking cream cheese. Do you know what that was? I have been looking and cannot find that exact cream cheese. And in this recipe post it now it does not have a specific kind of cooking cream cheese. I made this last week, and oh my goodness, it was delicious! Definitely worth trying out this recipe. 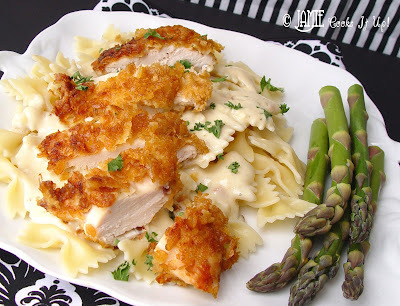 The sauce was wonderful, and I was really happy with how crunchy and juicy the chicken came out. I want to just make the sauce and pasta for a New Years Eve dinner.. 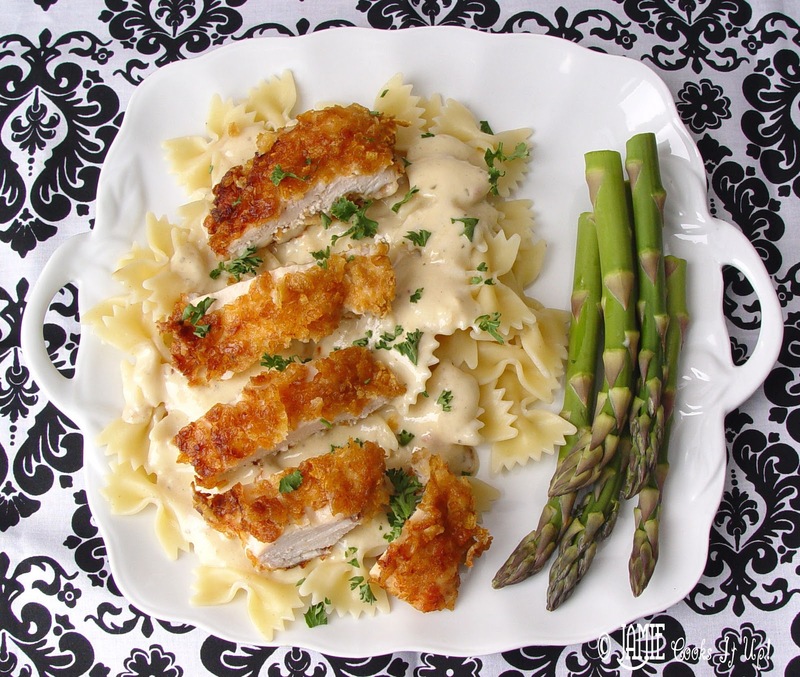 Since there are a lot of chicken ingredients in the sauce, do you you think this would taste good with Scallops?